Bougth this Easter Anya from The Greeting Farm a couple of months ago, so I really wanted to use her on a card (I usually dont send Easter cards). I also had some nice color coordinatad cardstock with roosters, silver ink and ribbon, and the fun bg Life of the Party Dots from Hero Arts. I also wanted to enter the card in this months Hero Arts contest, so I choose one of the sketches. 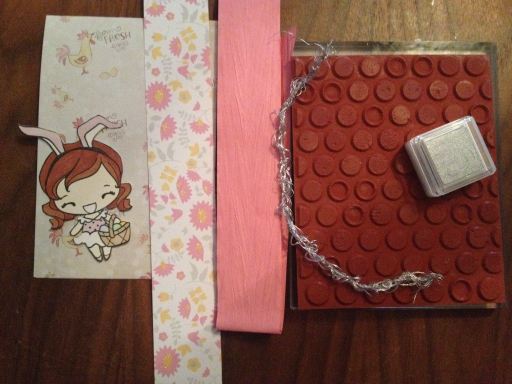 I stamped the dots in silver on a pink paper ribbon and wrapped it around the flowery scrap. Finally I wrote Glad Påsk with a calligraphy pen.